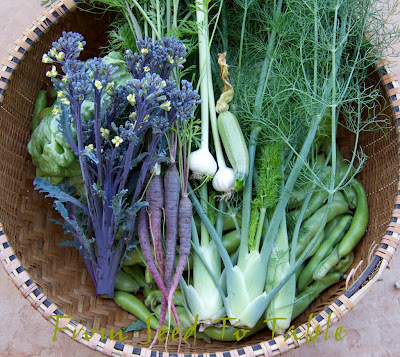 There was a fair amount of variety in the harvests this past week. A few new items hit the harvest basket along with some of the "regulars" that we've been enjoying for the past few weeks. Zucchini season has started, that's the first Romanesco zucchini up there on the left. 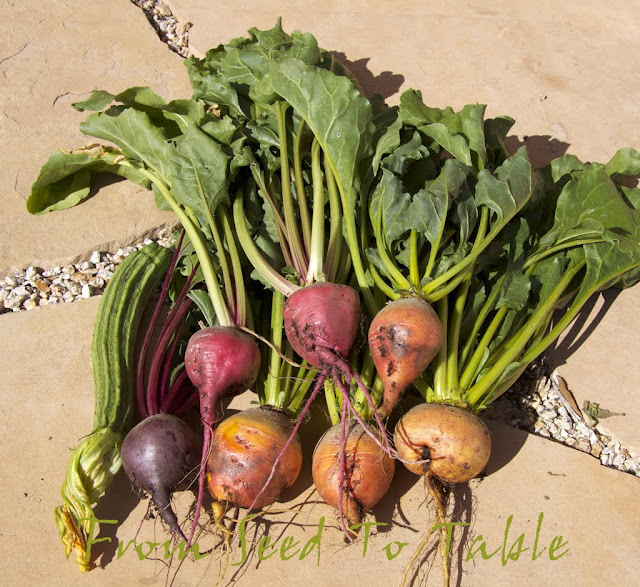 The beet harvest continued with one Baby Ball, a couple of Chioggia, and a few Golden Beets. 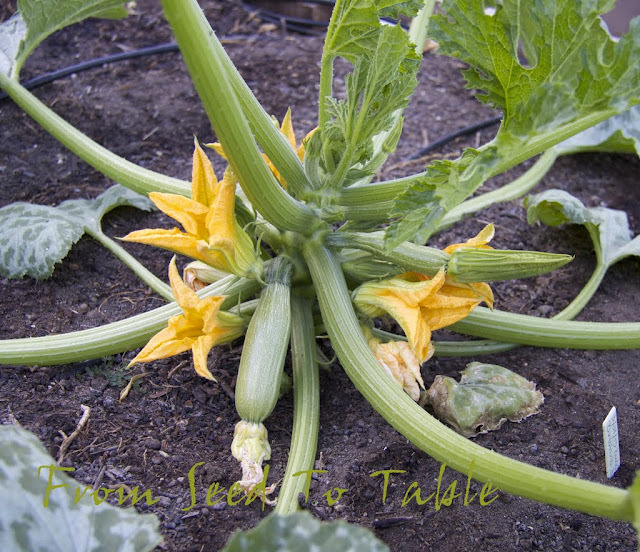 Zucchini blossoms are always a treat! The Ortolano di Faenza plant put out a bunch of male blossoms which I promptly harvested and incorporated into a frittata. The lettuce harvest is in high gear. 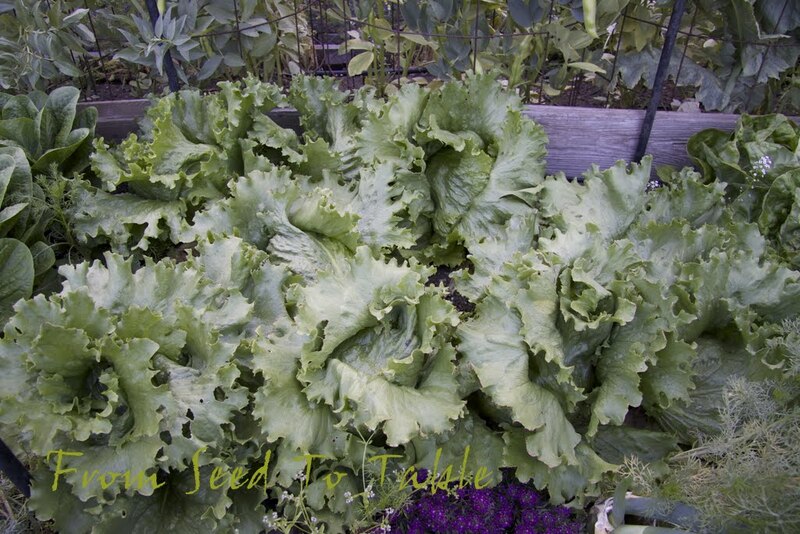 The butterhead lettuces are looking a bit ragged around the edges and that one above had some tipburn on the inner leaves but most of it was lovely. The napa cabbages are coming in fast also, and some of them have some sort of problem with browning on the inner leaves which I can't figure out, but most of the head is still quite good in spite of the problem. 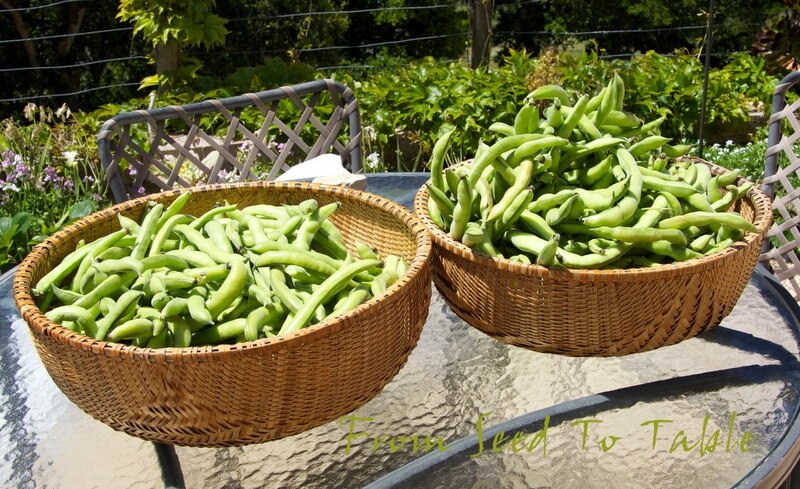 That's the last significant harvest of fava beans. I just cut the plants down to the ground yesterday so the season is officially over. 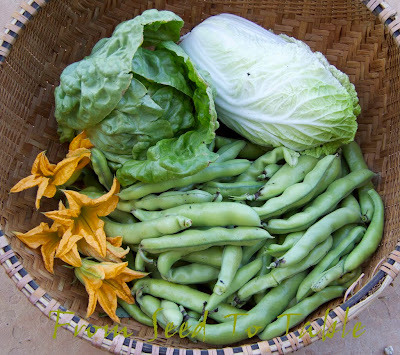 There were a number of miscellaneous vegetables ready to harvest that day in addition to the lettuce, cabbage, favas, and flowers. Purple Peacock broccoli, it got away from me in a snap and started to bloom. It was still sweet and delicious. 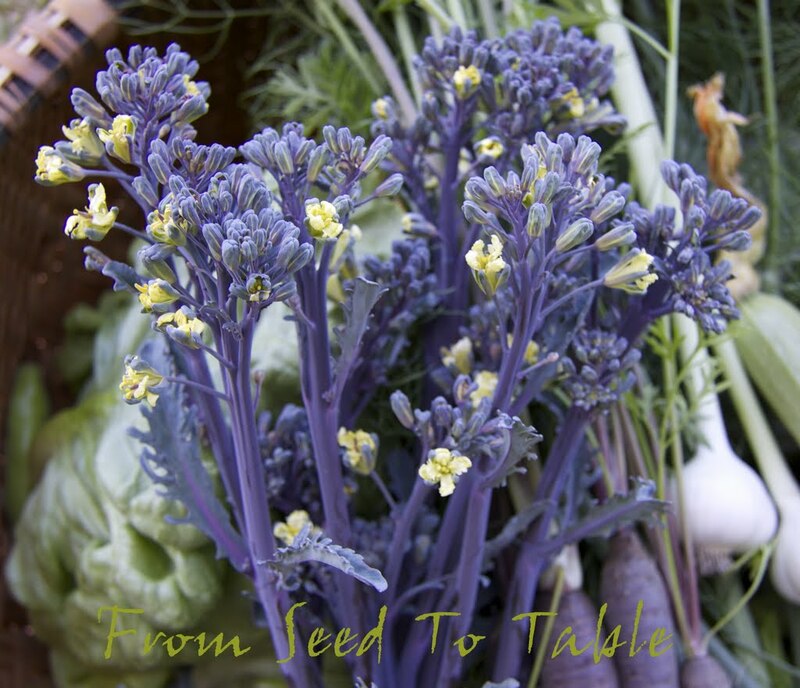 This went into the frittata with the zucchini blossoms. A couple of very fresh heads of Lorz Italian garlic which was also destined for the frittata. 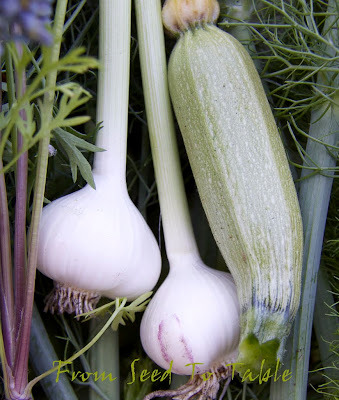 Yes, both heads, they were very small and garlic is oh so mild when it is freshly pulled. That's the first Ortolano di Faenza zucchini, a petite and tender sweet that I sliced thin and put into, no, not the frittata, my lunch salad. 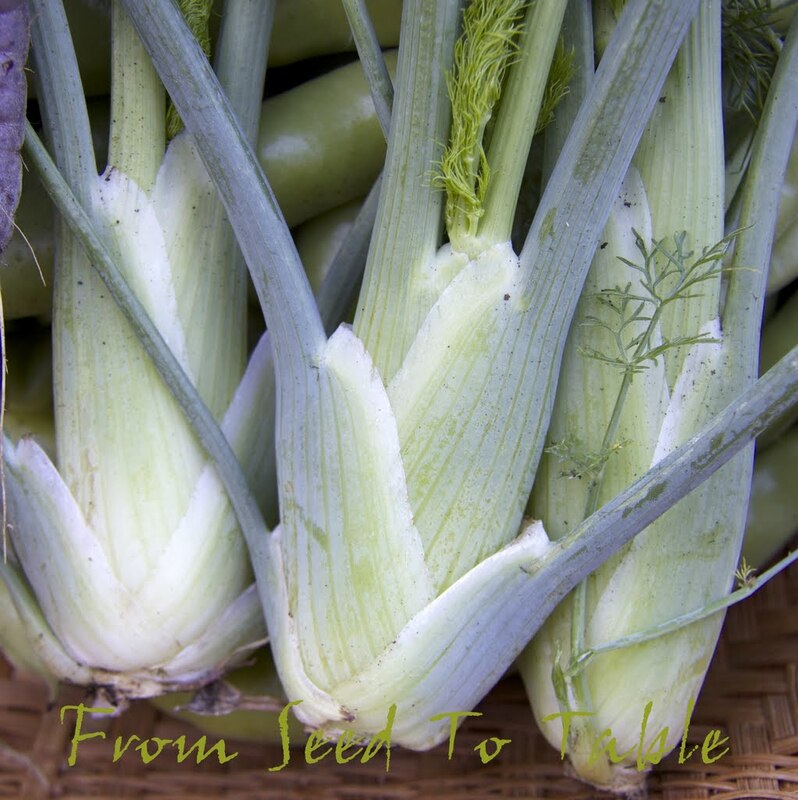 Baby fennel, thinnings from the fennel patch. 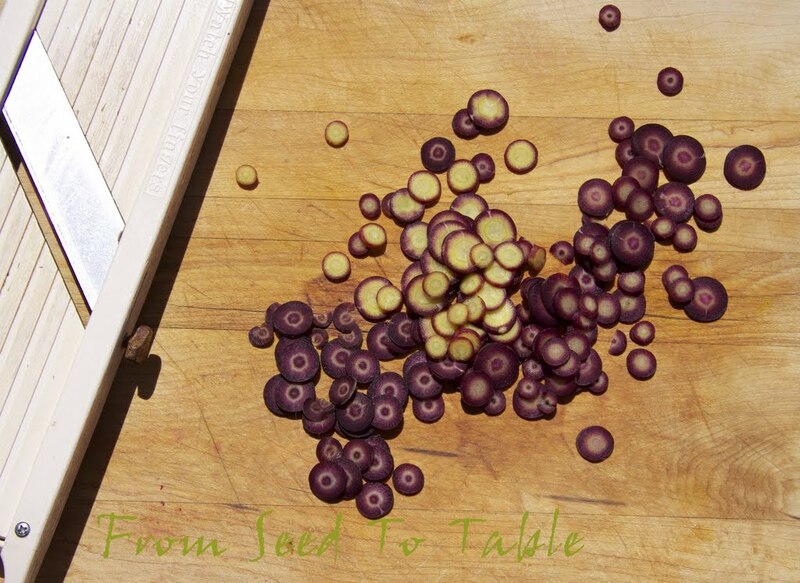 I've been slicing the "bulbs" very finely on a mandoline and adding them to my lunch salads. Most of the tops were still quite tender so I chopped them and used them in a soup with one of the heads of napa cabbage. These are the first significant sized Deep Purple hybrid carrots that I've harvested. They were also thinly sliced on my trusty (slightly rusty) Benriner Japanese mandoline (I also have a big heavy fancy French mandoline that I bring out for big jobs). There's a bit of variation in how purple each root is. 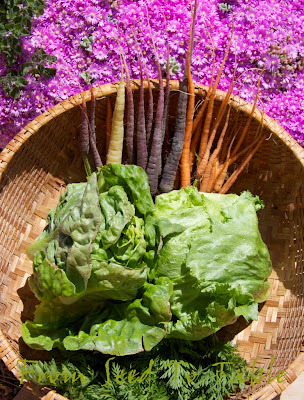 These are quite pretty and pretty tasty as well, not quite as sweet as orange carrots but still good and so pretty in a mixed salad. Another harvest of butterhead and iceberg lettuce (another yummy wedge salad!). 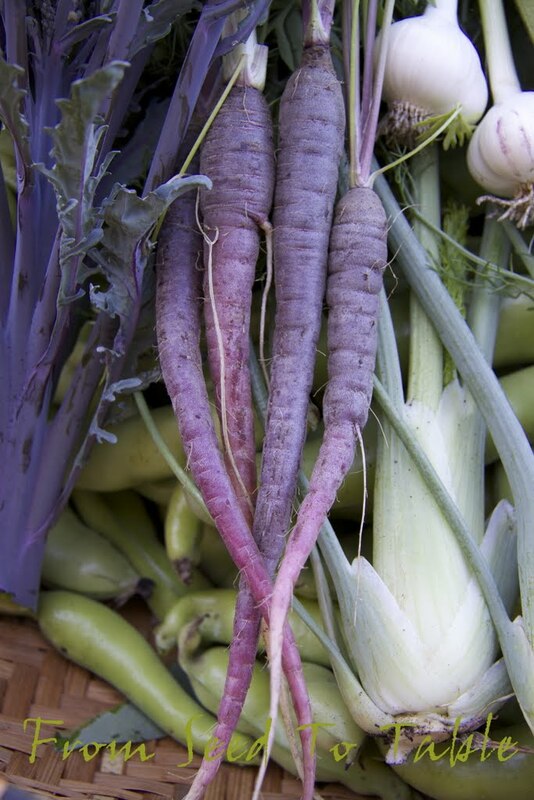 And more carrot thinnings - Circus circus mix on the left, Deep Purple center, and Sugarsnax on the right. All destined for the salad bowl. I harvested all the baby pak choi that I planted on the edge of the zucchini bed, they sized up just in time, the zucchini leaves were just starting to edge into their space. I used half of these last night in a stir fry with spicy bean sauce and (oh gasp!) shredded duck confit. Purists may be shocked at my addition of duck confit to a stir fry, but it was there in the fridge needing to be consumed and the outcome was really quite delicious. And that's another head of napa cabbage that had to be harvested but hasn't been consumed yet. That's the first head of Di Ciccio broccoli and the final gleaning of fava pods. 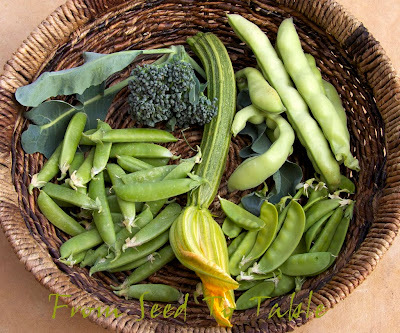 Another Romanesco zucchini, a better than expected haul of sugar snap peas and the final harvest from the first planting of snow peas (that harvest lasted only 12 days!). 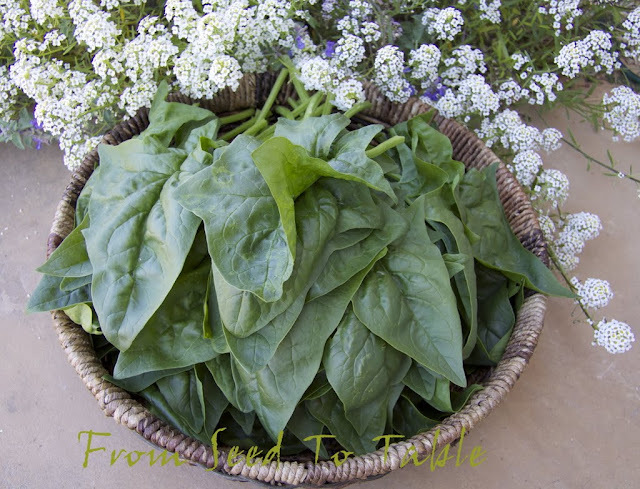 More spinach! 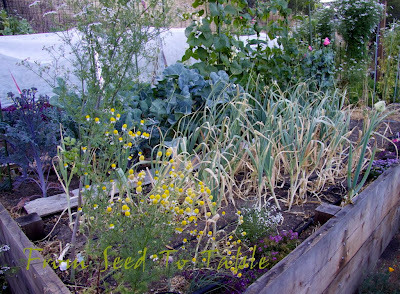 The plants are starting to bolt but there's still a couple of harvests left on them. Whew! That's all the harvests for the past week and the fridge is stuffed. (It doesn't help that I went on a fruit binge at the farmer's market). The weather went through a bit of a dramatic change this week. Last Monday the high hit 86ºF and then for the rest of the week the highs hung down around 60ºF with cool breezes that made it feel downright chilly. 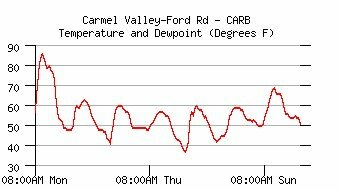 Yesterday was a bit of an improvement, it almost got to 70ºF! And there's supposed to be a slight chance of showers tonight. OK, I guess we're back to spring again. Baby Ball beets - 3.2 oz. Chioggia beets - 7.2 oz. Renee's Golden beets - 16.9 oz. Di Ciccio broccoli - 2.1 oz. Purple Peacock broccoli - 3.8 oz. 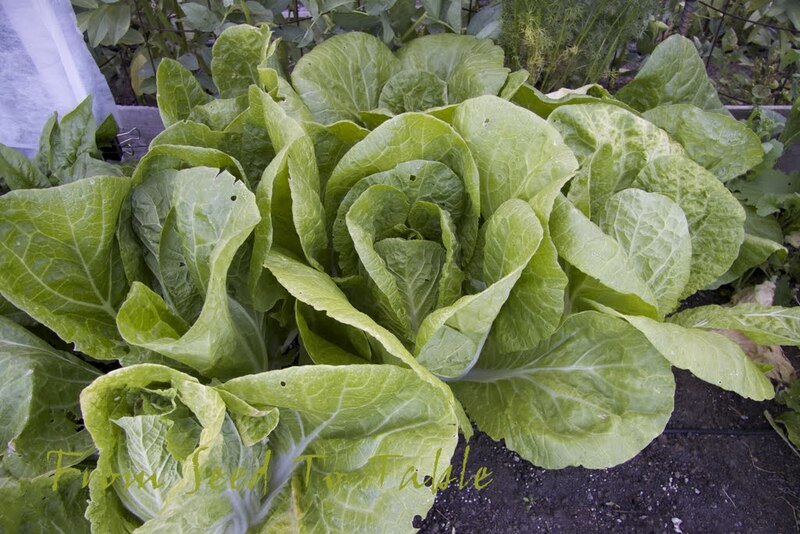 Little Jade napa cabbage - 3 lb.. 14.2 oz. Circus Circus carrot mix - 2.3 oz. 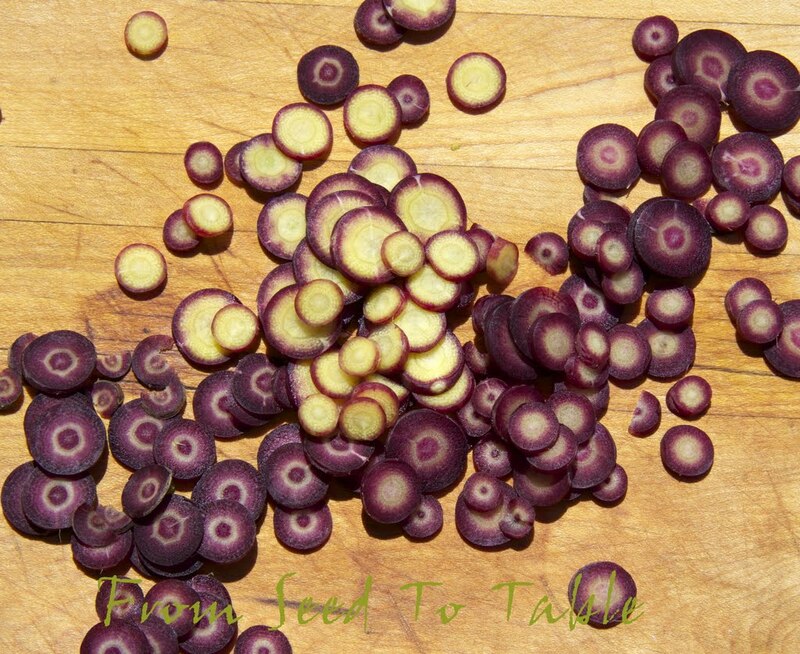 Deep Purple carrots - 8.3 oz. Sugarsnax carrots - 4.3 oz. Extra Precoce Violetto fava beans - 3 lb., 8 oz. Romanesco fennel - 11.7 oz. Lorz Italian garlic - 4.7 oz. 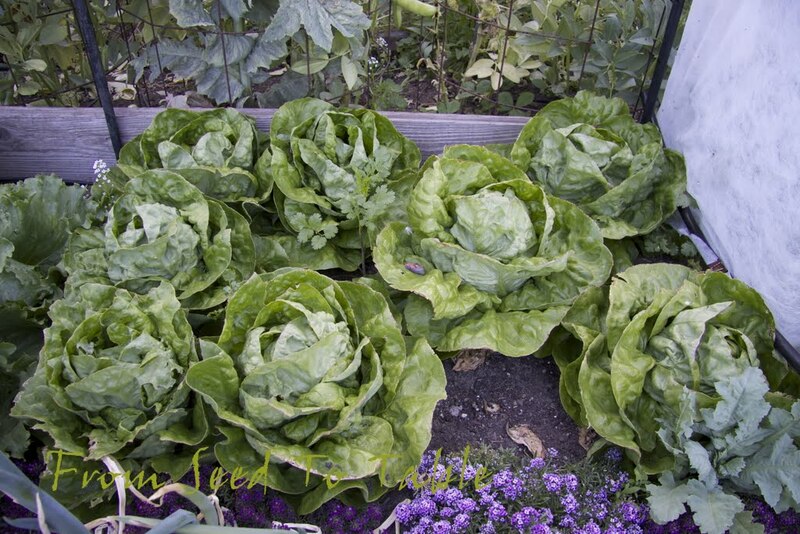 Iceberg Superior lettuce - 1 lb., .2 oz. Rhapsody butterhead lettuce - 1 lb., 5.8 oz. 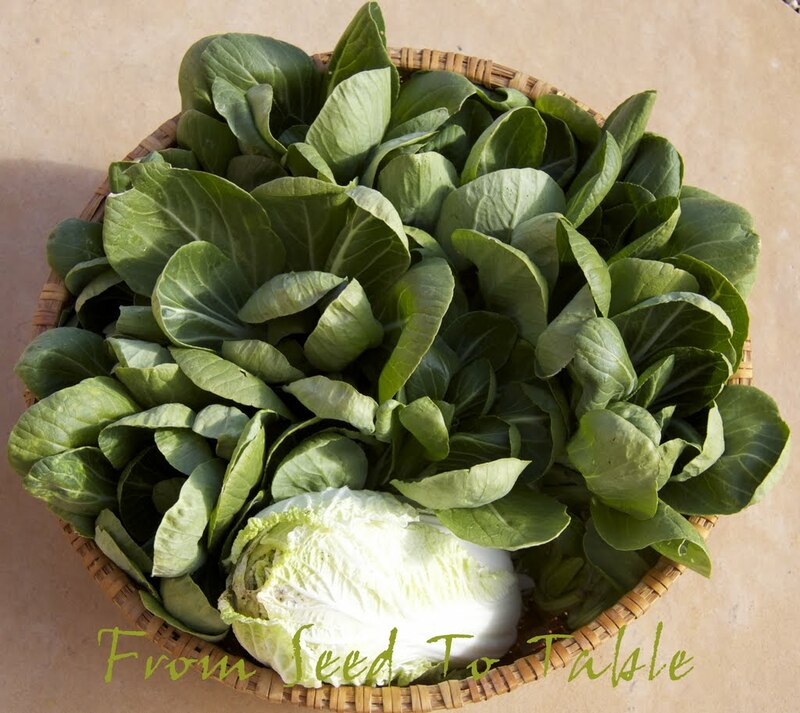 Green Fortune baby pak choi - 2 lb., 15.1 oz. 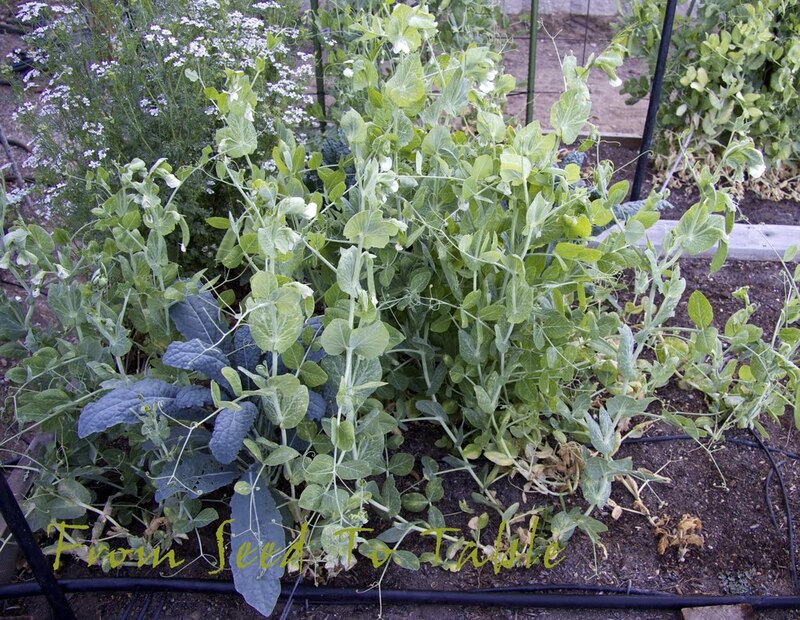 Oregon Sugar Pod II snow pea - 12.4 oz. Summer Perfection spinach - 15.9 oz. Ortolano di Faenza zucchini - 1oz. Romanesco zucchini - 13.2 oz. 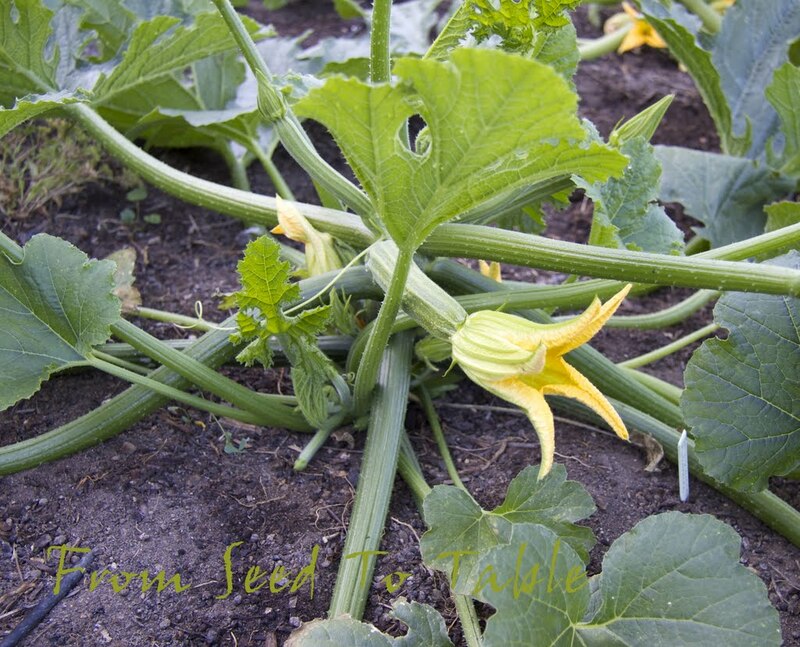 Zucchini blossoms - .8 oz. The total harvests for the week came to - 19 lb., 7.1 oz. Which brings the total harvests for the year up to - 125 lb., 14.7 oz. 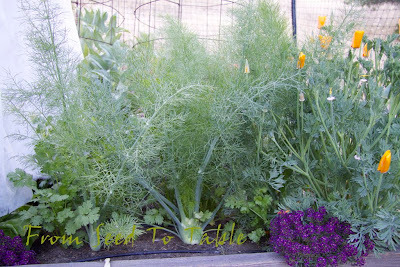 It's time for the May garden tour. 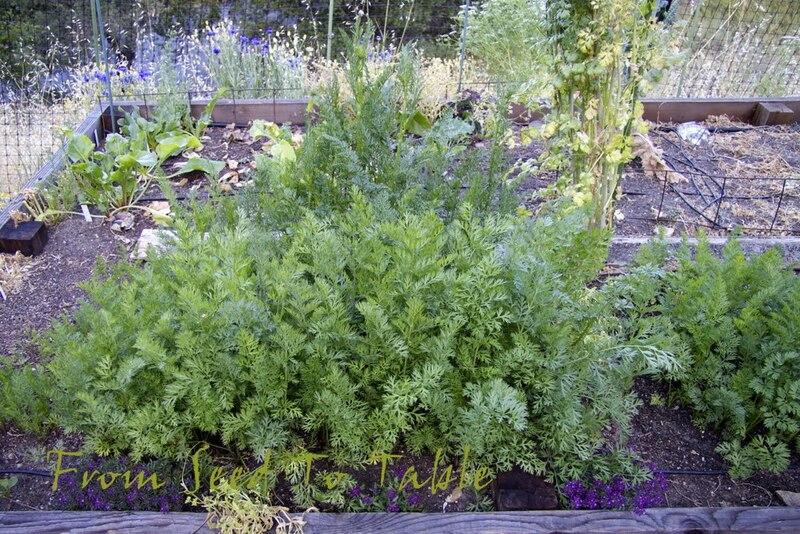 These tours may be boring for those of you who follow my blog, but I find it fun and informative to compare the current garden to the garden in years past at a similar time. 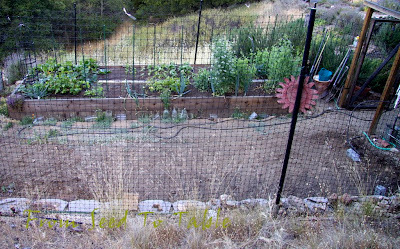 Last year, practically to the day, I was setting the tomato plants out into one of the newly constructed beds. There wasn't much else growing in the garden in May of last year, only two of the four beds were completed and I had barely started to fill them with vegetable plants. This year the tomato plants are still awaiting their places in the last of the beds to be constructed. There's the photo of the area for the new bed. The good news is that work started yesterday! The other three beds are in various states of production. 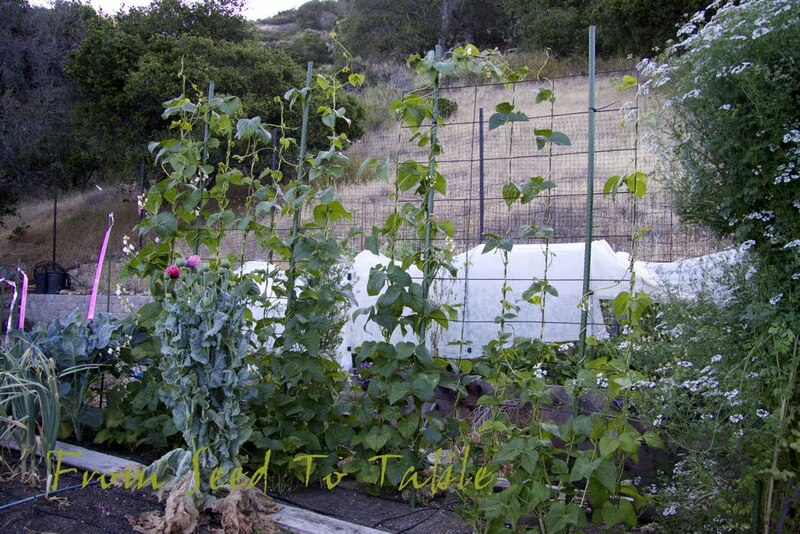 The bed you see in the photo below is home to the curcurbits and most of the legumes growing (or not) at the moment. I'm growing two varieties of zucchini this year. 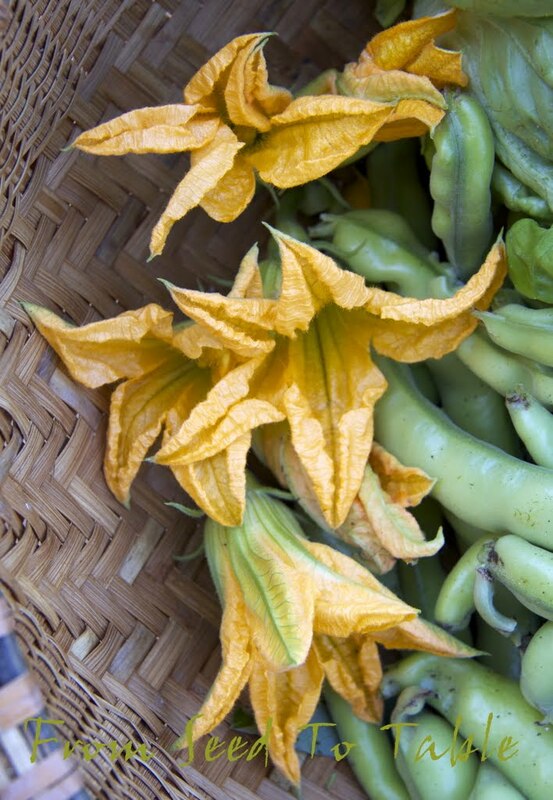 This one is Ortolana di Faenza, an Italian heirloom. That's the very first squash to set on the plant and I harvested it yesterday along with all those beautiful blossoms. This is Italian Romanesco zucchini, an F1 variety that is supposed to be more disease resistant. It also produced the first fruit this week. 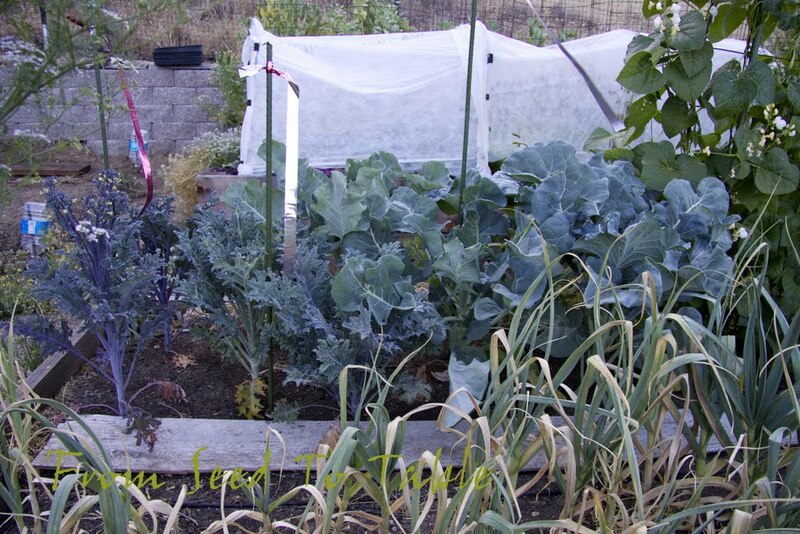 I set these baby pack choi out just after I set out the zucchini plants and they are ready to be harvested just as the zucchini plants are about to engulf them. 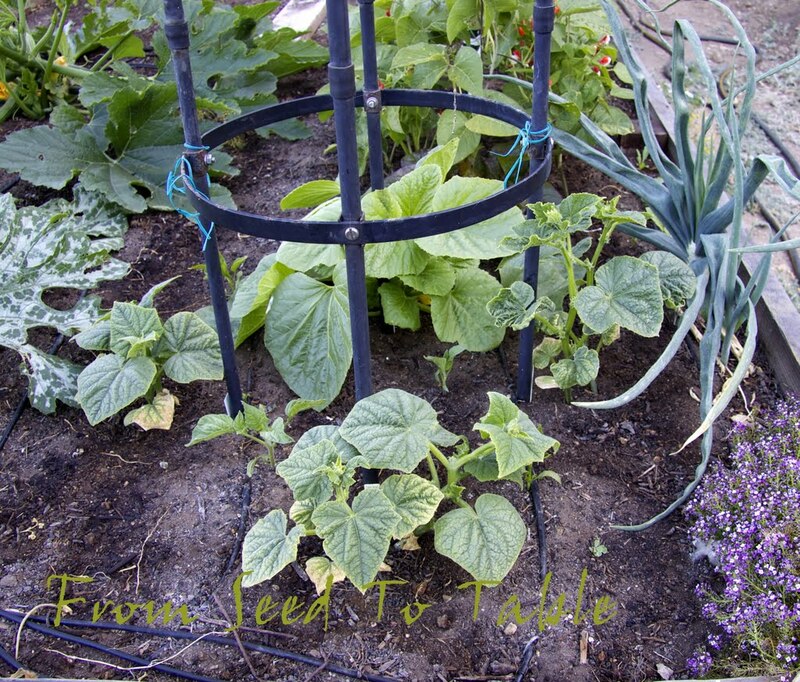 I have four varieties of cucumbers started, Green Fingers baby Persian, Tasty Green Japanese, Garden Oasis beit alpha type, and Tortarello Abruzzese. Last year I grew both the Persian and Japanese cucumbers and had more than enough of each for fresh eating (I don't make pickles). This year I decided to grow the same number of plants but dug out some old seeds to try to get a bit more variety in the harvests. The Tortarello Abruzzese seeds were about 10 years old and I managed to get one seed to germinate. 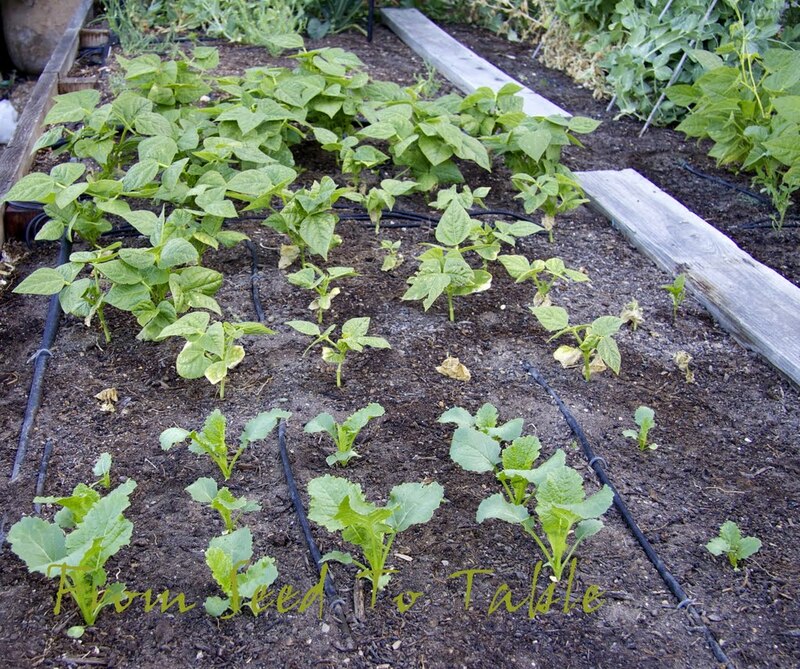 The other varieties germinated readily and I set the plants out weeks ahead of the Tortarello. Unfortunately, I think that my gamble to try an early start with the cucumbers has not gone well, the plants have been languishing. 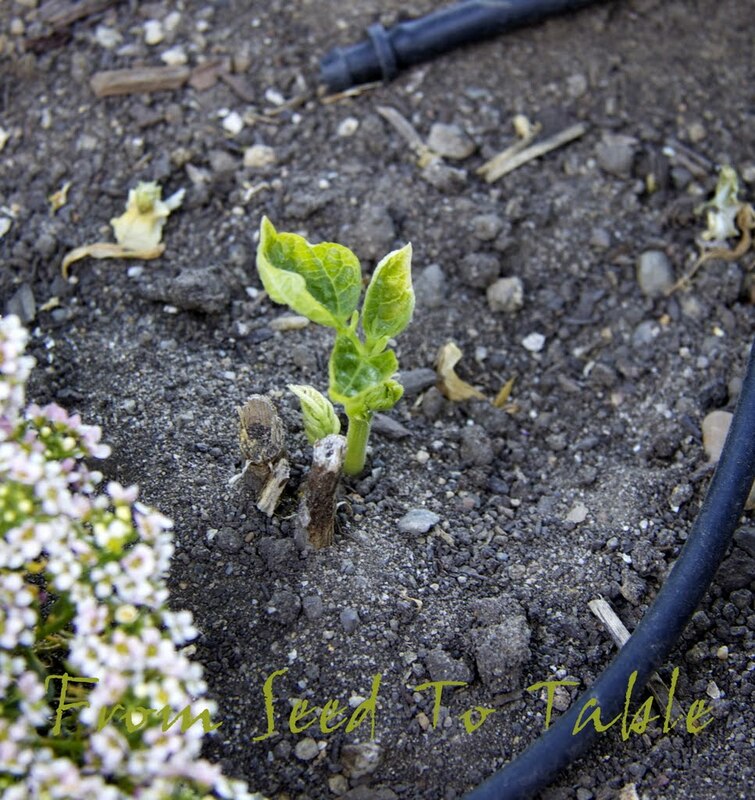 Except for that Tortarello - the one seed that germinated produced a rather weak seedling which I planted out on a lark. Well, look at that thing, it's the nice healthy looking plant in back. Also languishing, much to my surprise, are my runner beans (sorry David). 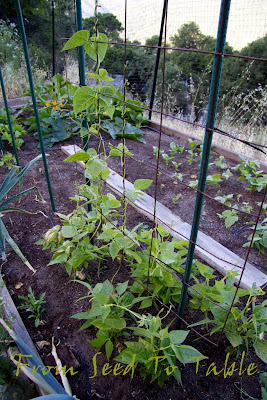 The Moonlight beans on the right side of the trellis are especially unhappy, but the St. George on the left, in spite of starting to climb the trellis, don't seem to be particularly vigorous either. I'm taking a wait and see approach with these, perhaps they'll perk up when the nighttime temperatures warm up a touch (they're still dropping to the high 30's and low 40's). 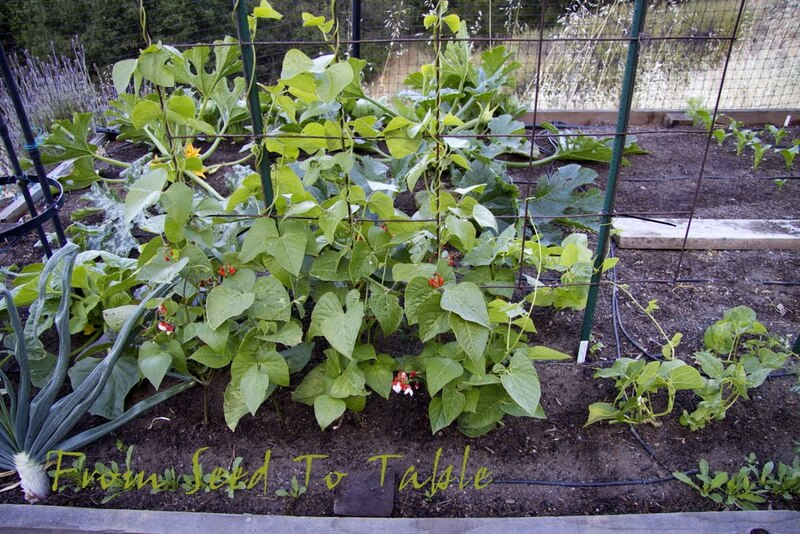 My attempt to get my pole snap beans is pretty much a bust also. 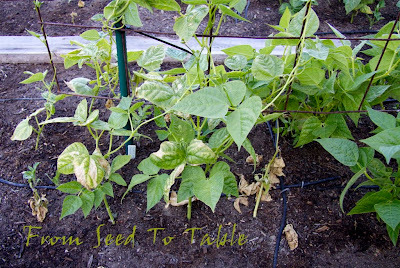 I've grown this variety of bean (Spanish Musica) a couple of times before and I know that once they get going that they produce huge vigorous plants and loads of big beans. But these babies are staying babies, or worse, they plants keep dying. So, I'm writing these off. 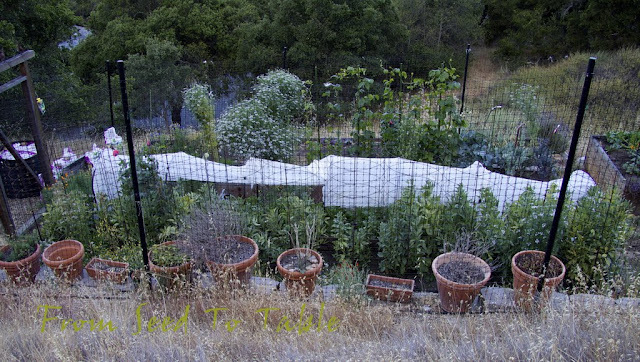 I've got their replacements already germinating and I've got the last trellis in place and ready for them. 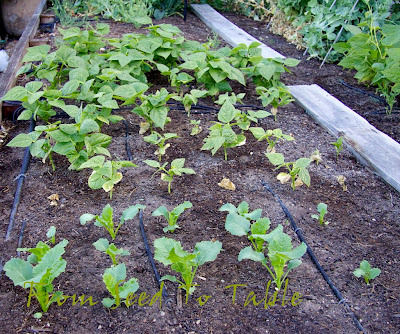 Once I get those in the ground I'll tear out this planting and start the seeds for the Italian beans that Stephaneener sent me (thank you!). 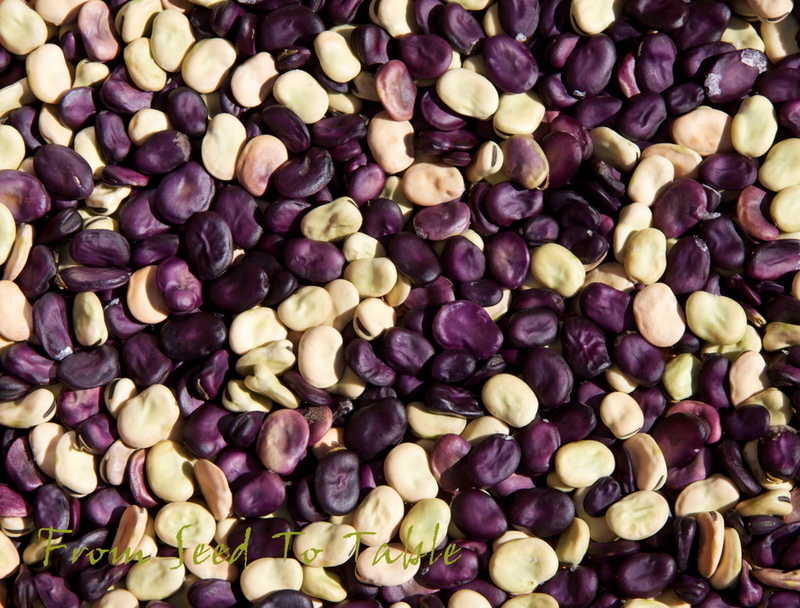 It's really been a crappy season for most of the legumes in my garden. 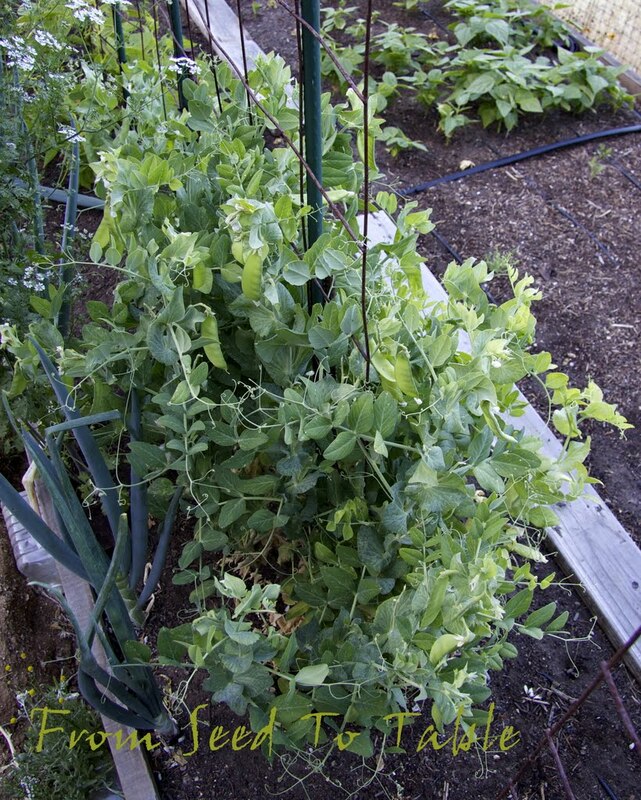 At least half of my sugar snap pea plants have died, here's what is left of that planting. 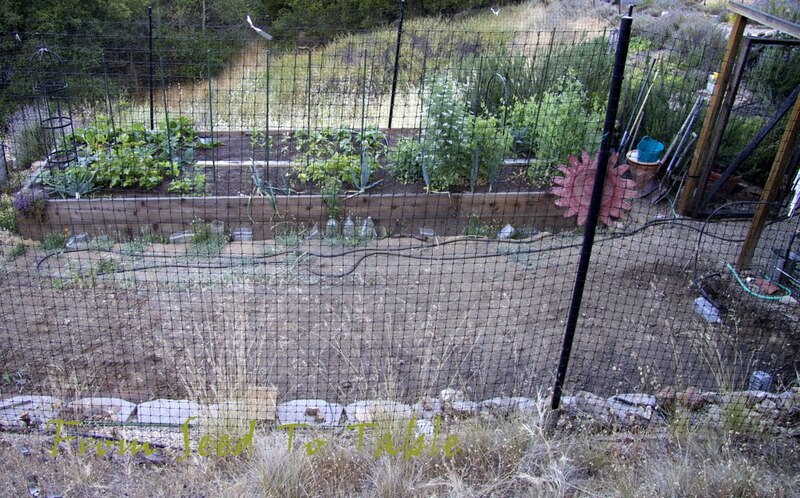 I think the problem here is that the drip lines got kinked and the plants dried out when we had some early heat waves. By the time I figured out what the problem was it was too late for most of the plants. The harvest is so meagre that I'm not even bothering to tally it. I'm going to rip these out soon and replace them with some Australian Butter Beans that Alyse sent me (thank you too!). 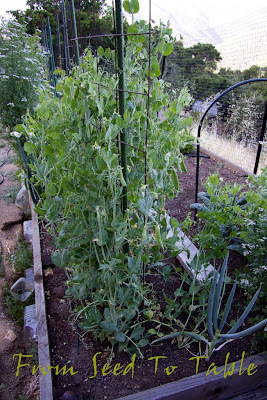 The snow peas, on the other hand, have been producing quite nicely. This year I divided my planting into two. Here's the first planting which has produced a lot of peas in the last two weeks. 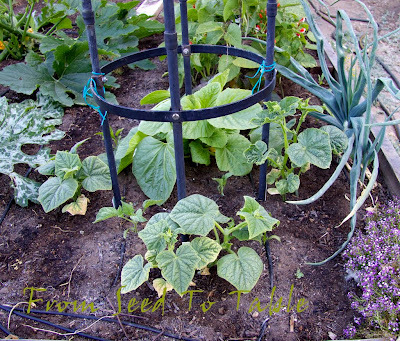 And here's the second planting on the other side of the trellis. I remembered to plant them on the south side so that the seedlings wouldn't be shaded by the first planting. 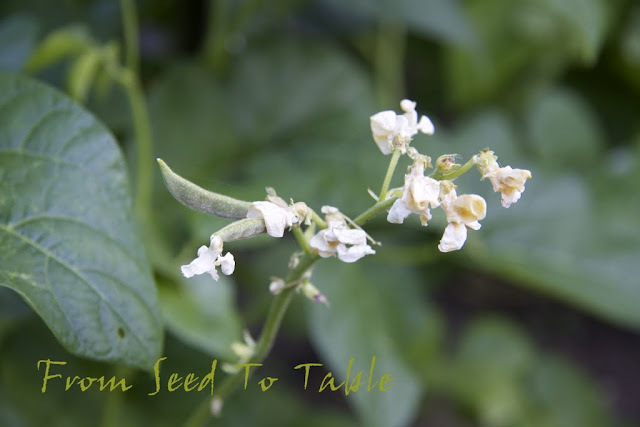 They are just starting to bloom so I hope to be harvesting another round of peas in a couple of weeks. The problem with this variety of snow pea (Oregon Sugar Pod II) is that the plants produce the entire crop in about 2 weeks. 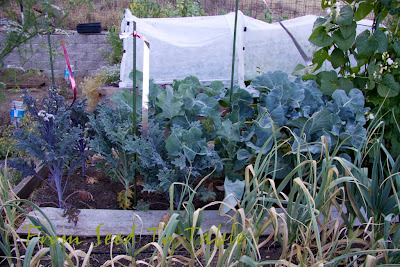 I really prefer to consume the harvest as it is produced, I don't like preserved snow peas, so that's why I split my sowing in two this year and I think it's going to work out OK.
Below, in the foreground is a small planting of Early Rapini. 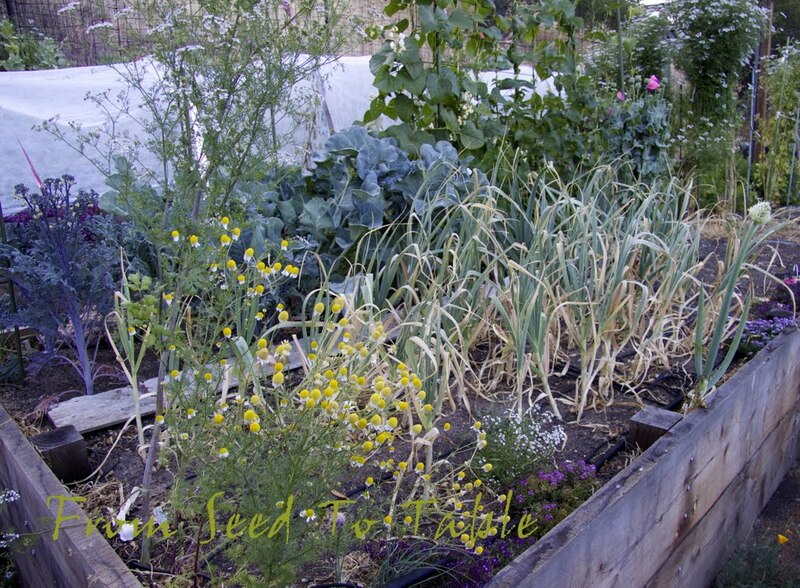 I lost a few seedlings when we had a couple of hot days just after I planted them out, but what's left should give me one nice harvest that will be enough for the two of us. 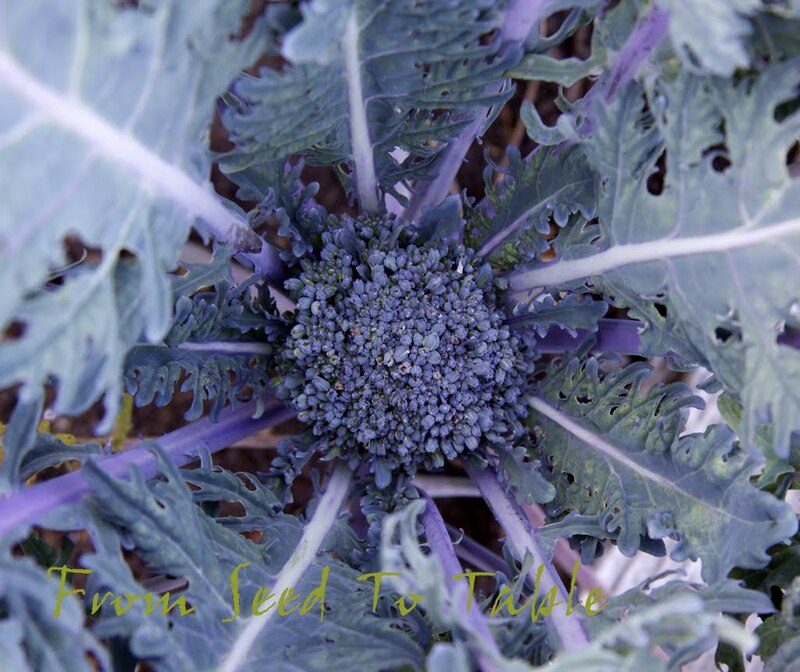 This variety grows really quickly once it gets established. 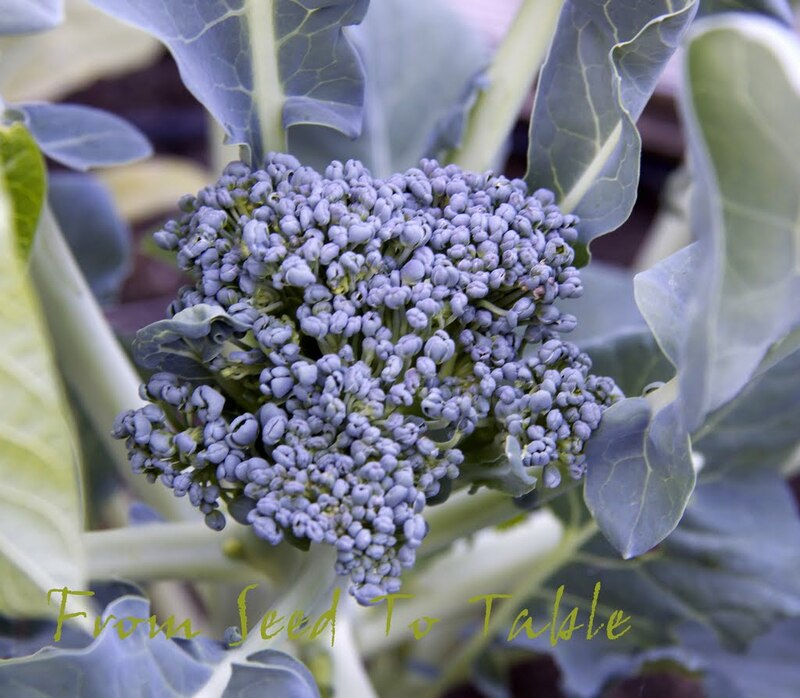 It's time to start the next set of seedlings now. 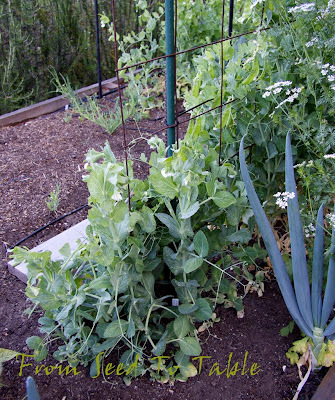 Beyond the rapini is an attempt to grow some Fagiolo del Purgatorio dry beans. I made three successive sowings in paper pots. My seeds are a bit old, which is one reason why I want to get a planting going, I need to replenish my seed stock. But I've been getting poor germination (all the more reason to replenish the seed stock) and on top of that the seedlings keep dying after I set them out. I've probably been trying to get these started too early also, so I'm going to start yet one more round of beans. This is what is left of the Dou Miao planting. I got one good harvest of shoots and then the plants started to die. 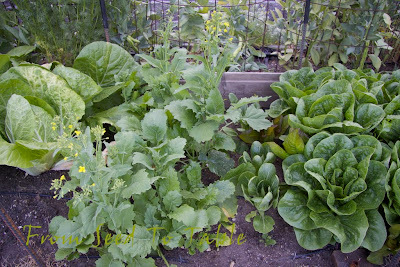 There wasn't enough left to bother with harvesting so I planted some kale in the empty spots and left the peas to grow. 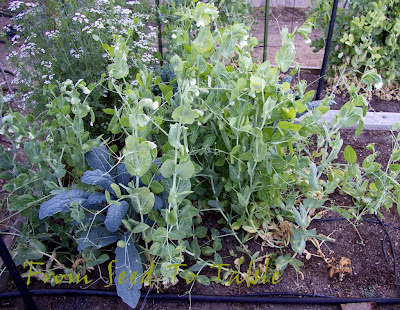 They are producing pea pods but I don't find them worth eating, this variety of pea was bred for the shoots. The kale doesn't seem to mind the peas so I think I'll let the peas set seeds and collect them. So that's it for the marginally successful legume bed, let's hope the curcurbits do better. 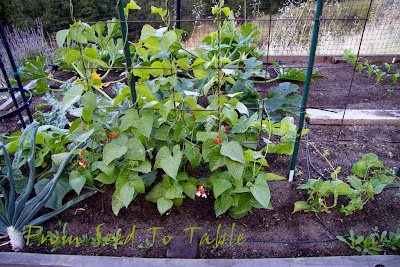 On to the bed which is dominated by the Greek Gigante beans which are going into year 2 now. The vines are starting to top the trellis. And there are blossoms and a few beans setting already. And one of the plants that I thought was dead has decided to pop a shoot after all. The Lorz Italian garlic is ready to harvest. 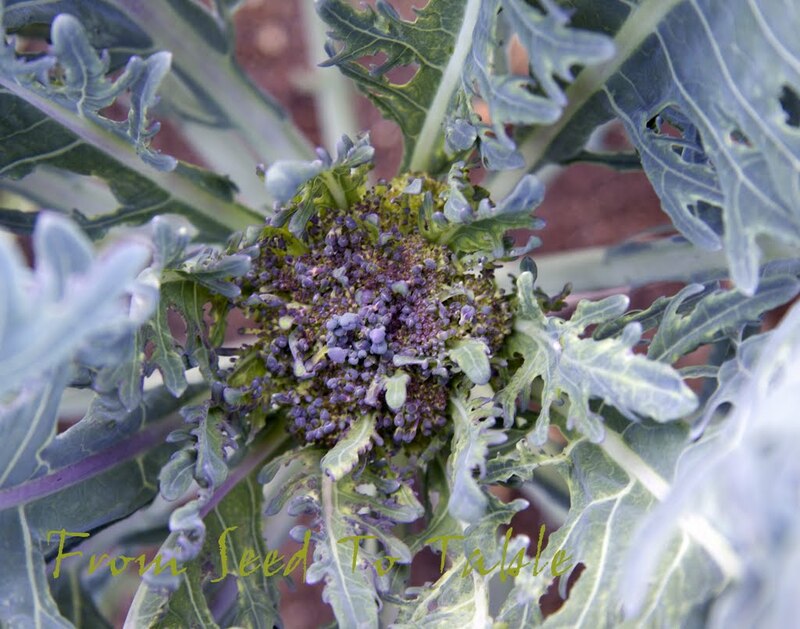 The broccoli is starting to produce. The first Purple Peacock broccoli produced a head and lickety split it started to bloom. There it is on the left. I harvested it and cooked it up and found it to be quite tasty. 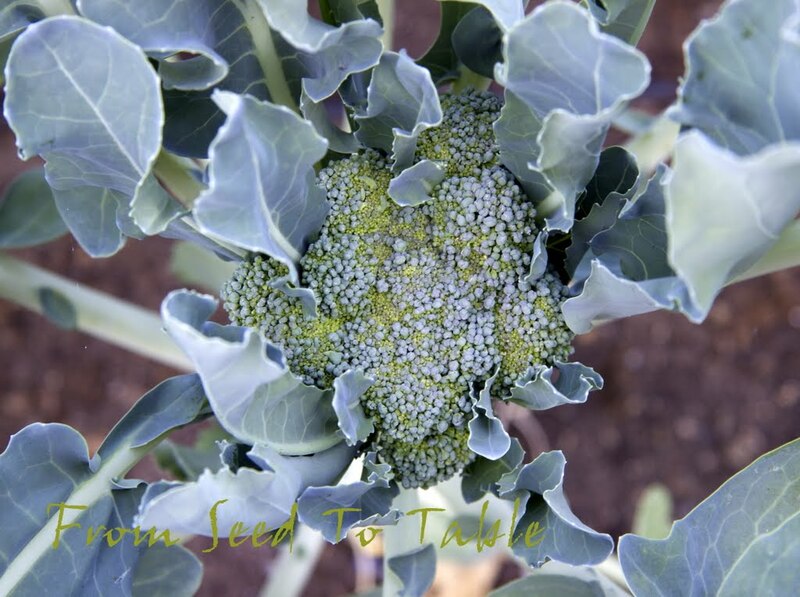 Here's a very nice head of Di Ciccio broccoli forming. Here's another Di Ciccio head ready to harvest already. There's quite a bit of variation in head size in this old heirloom variety. This used to be one of my favorite broccolis, but it's been a few years since the last time I grew it. I'll see if I still like it as much as I used to. It used to be a very productive variety for me, producing lots of shoots over a very long season. 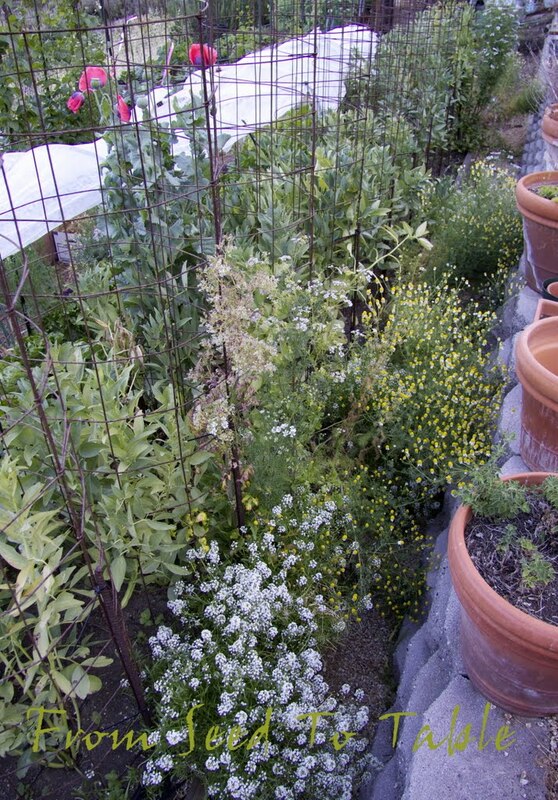 I've not grow it in this garden though so it will be interesting to see if a different microclimate makes a difference in the performance. Another head of Purple Peacock. And one more Purple Peacock. There seems to be quite a bit of variation in this broccoli as well. 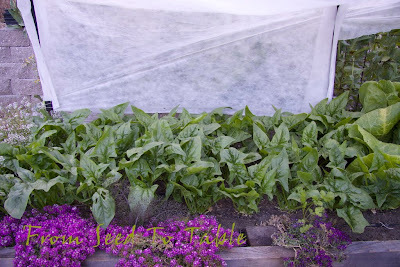 Across the way in the third bed, here's the spinach just before I harvested another pound of leaves. The plants are just starting to bolt. Alongside the spinach are the Little Jade napa cabbages, most of which are ready to harvest. And next are the resprouting and blooming Early Rapini plants that I harvested a couple of weeks ago, and a few baby bok choi, and some Sweetie Baby romaine. Iceberg lettuce, still hanging in there in spite of a few hot days. 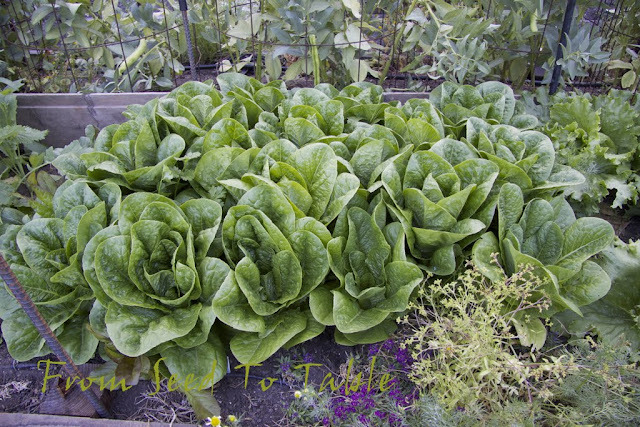 I've been reading lately how difficult it can be to grow iceberg lettuce, it has a tendency to bolt before it produces a good head. I guess I've been lucky. The butterhead lettuce needs to be harvested. It has grown so quickly! But not without problems. Perhaps you can see that the edges of some of the leaves are a bit brown. And the head that I harvested yesterday had some browning around the edges of the inner leaves. I did a bit of research and I believe that my butterhead is suffering from tipburn. That's a problem caused by a calcium deficiency in the leaves, much like blossom end rot in tomatoes. It's not likely caused by a calcium deficiency in the soil, it's an uptake problem caused by water stress, in my case probably because we've had some hot days and perhaps because of inadequate air circulation around the plants which slows down evapotranspiration. Time to eat more salad! 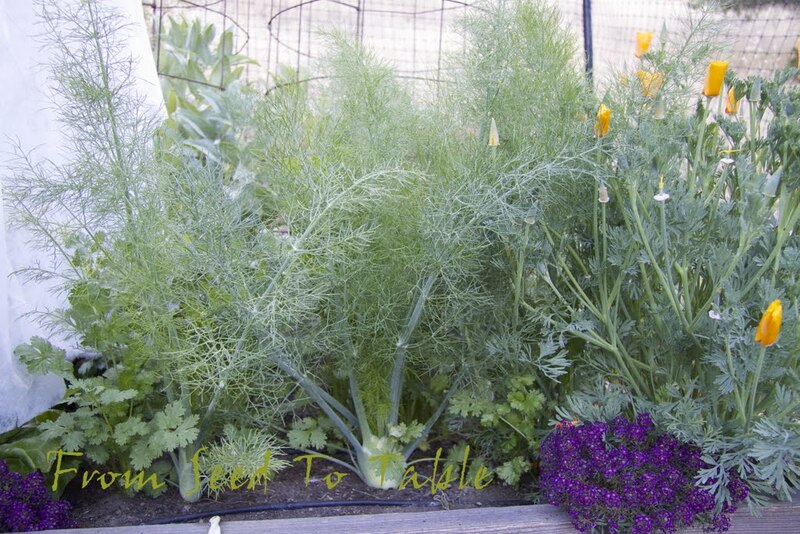 My little planting of fennel is coming along. 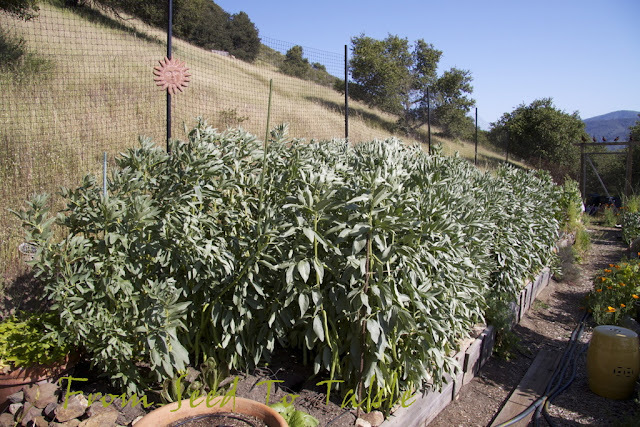 The fava plants are finished producing and are declining. It's time to remove the cages and cut the plants down. 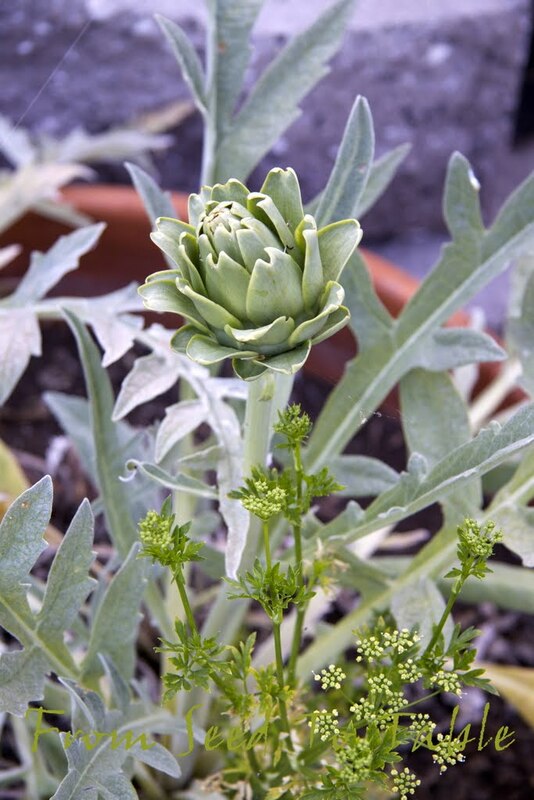 One final surprise, my potted artichoke has decided to bloom. I won't harvest this. It will be allowed to bloom and be a magnet for bees. The last time this plant bloomed I had a lot of fun watching the bumble bees "swim" through the flower. I hope the bumbles come again. One last view over this end of the garden. 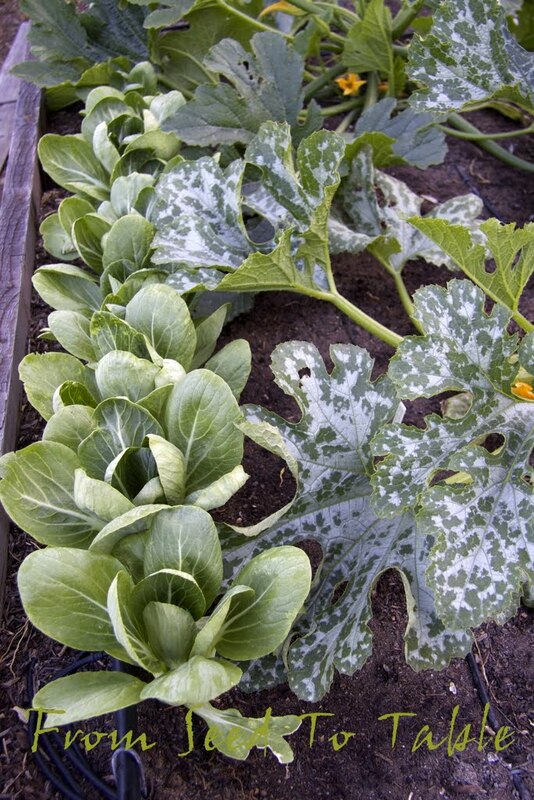 How's you garden growing this May?